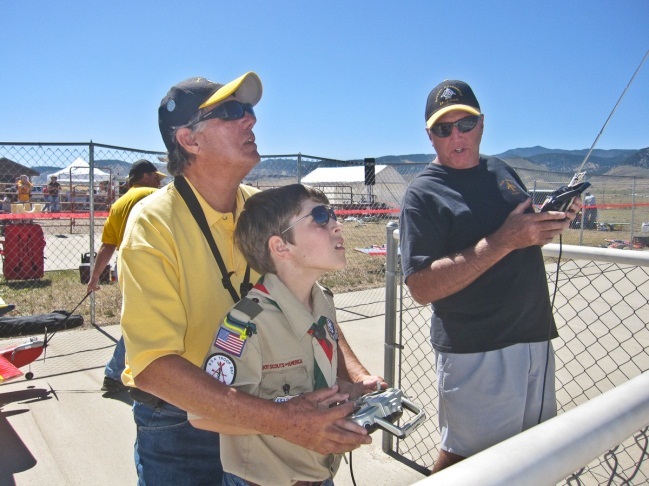 It has been said that the Arvada Associated Modelers is a goal-oriented club. 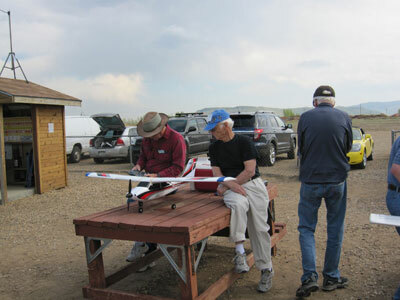 One of our primary goals is to introduce new folks to the fun and enjoyment of safely flying model aircraft. With this goal in mind, we have developed a FREE formal training program which takes place at our East Field every Thursday night 4pm until dark during the summer months beginning on the first Thursday of May and ending on the last Thursday of September (weather permitting). We welcome anyone interested in learning more about RC models to come out and take a no risk / no obligation introductory flight with an Instructor on a club plane and buddy box. We also encourage new fliers to bring their own plane (if they already have one) and we will be happy to inspect the model for safety and airworthiness, trim it to fly straight, and help them learn the fundamentals of flying their plane with buddy boxes and cords which we supply (subject to compatibility). We will do our best to accommodate any aircraft that you may have, but there are some that do not have the ability to utilize a trainer system. For aircraft with no trainer system available, we will do everything we can to assist with getting it setup and flying straight. Existing members are welcome as well. If you’re feeling a little rusty or need help maidening a new plane, come on out and we’ll help you. We are a flying club and training night is all about flying. Safe, fun flying! Join the Training Mailing list — This list will be used to send training night updates only. This is strictly a notification list and only AAM Training staff will be able to post updates to this list. You may also download the AAM Solo Exam to see what it takes to pass the flight instruction. 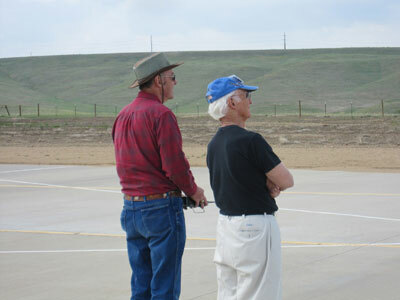 Instructor Pilots — Register a new student. You will need to log into this site as it is a members only site. How hard is it to learn to fly? Everyone learns at their own speed — some are very comfortable with the controls immediately and some take a little time to become comfortable with them. The biggest thing to remember is “Relax and have fun” as there is no time limit on learning. What kind of plane should I get? This is a personal decision, but here is what “I” tell people. If you are new to the hobby and have nothing purchased, talk to the people here at the field or at your favorite hobby shop. Most will be more than happy to offer opinions and advice. Every pilot I know has a favorite plane — one that they know inside and out and are very happy with it. There are several different versions of trainer aircraft, both electric-powered and glow-powered. If you come to our training night, we will be happy to let you fly with an instructor on whatever trainer planes we have (very often we have several different models on hand). Right now, the most common electric trainer in our club is the Apprentice made by E-Flight. They are very easy to learn on and in the event of an “aggressive landing” they are easily repaired. If parts are needed, the local hobby shops tend to keep a supply on hand (and most parts are inexpensive). This depends on the model you get. Most Ready To Fly (minor assembly, charge the battery and go fly) cost less than $300 complete. You would need to check with your favorite hobby shop for current pricing. Can my child fly one? This depends on your child. If they are good at video games and enjoy the experience then yes, your child may very well fly with no issue at all. Trainer airplanes typically fly anywhere from very slow (4 or 5 mph) to around 15 or 20 mph while a more advanced aircraft might fly upwards of 200+ mph. How high or far away can it go? For a standard trainer airplane, you will lose visual sight of the plane before you lose radio contact. For a micro (or park flier) plane, about 200 yards, but again, with a small plane like this, you would lose visual sight before you lose radio contact. Can you help me fly my helicopter or multi-rotor as well? 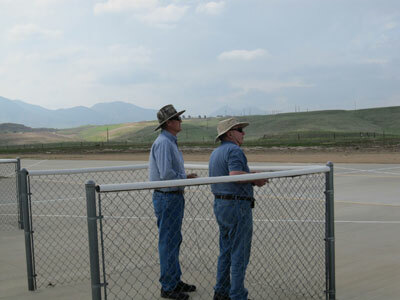 Yes, we have instructor pilots who are well-versed in helicopter and multi-rotor operations. If you are looking for this, please contact us so we can make sure someone is available on training night. If you have additional questions or, for more information or flight assistance outside of our formal training hours, contact the Chief Flight Instructor.